Imagine blissfully lying in bed after sleeping in late, listening to the quiet rumblings of your husband and children working away in the kitchen. The house smells of coffee and the savory breakfast items that are being lovingly prepared by those who love you most. It’s Mother’s Day and this is your day. Congratulations if this is happening in your house Sunday morning. I think for most of us things might be a bit different. Throughout the years when my boys were little and still to this day my husband has worked on Saturdays. This left him very little time to think about what was happening on Sunday, let alone plan a home cooked meal. The man has more strong points than I can list but cooking is not one of them. The little ones always have their hearts and intentions in the right place but have very little cooking experience. Their big ideas about a gourmet Mother’s Day breakfast would, in reality, wreak havoc in your kitchen. I love this recipe because it solves all of these problems. It allows you to take the morning off from cooking, makes your children feel like accomplished cooks, and it also gives you an excuse to get your kids in the kitchen to cook with you, all in the name of Mother’s Day. It’s genius! Put this together with your kids help, the day before Mother’s Day or any special day. 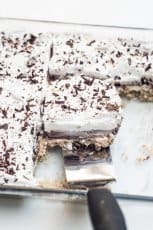 Let it sit in the refrigerator overnight and in the morning just mix together the simple topping and pop it in the oven. They will feel they’ve really done something special for you when this comes out of the oven and there will be very little to clean up. We’ll leave that part to Dad. He can’t get off the hook completely! 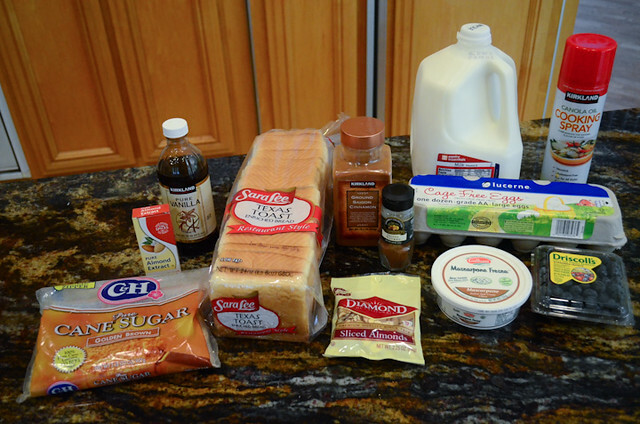 The grocery list – 1 loaf of Texas Toast or thick sliced bread, mascarpone cheese, fresh blueberries, eggs, whole milk, vanilla extract, almond extract, cinnamon, nutmeg, brown sugar, and sliced almonds. You’ll also need a little white sugar and few tablespoons of butter. One of these days I’ll get everything out before I start. Mascarpone cheese is an Italian, soft textured triple cream cheese that adds a rich, creamy goodness to this dish. If you want to lighten it up a bit, you could easily substitute reduced fat cream cheese but the mascarpone takes it into the stratosphere. You gotta try it. 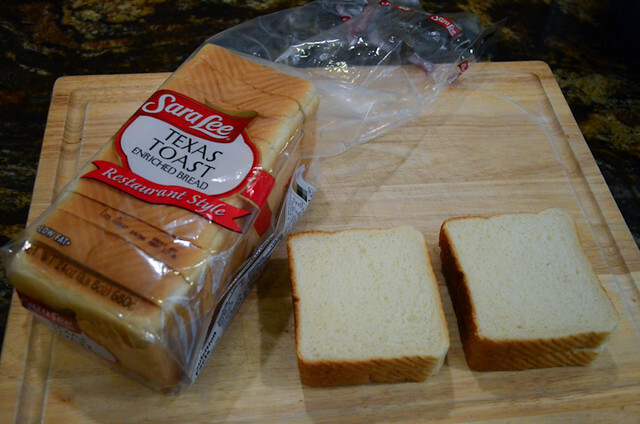 Texas Toast works great in this but if you can’t find it in your area, you can use a loaf of french bread cut into thick slices. Cut the bread into 1″ cubes. Place half of the cubes into a 13″ x 9″ pan that you’ve coated with non-stick cooking spray. 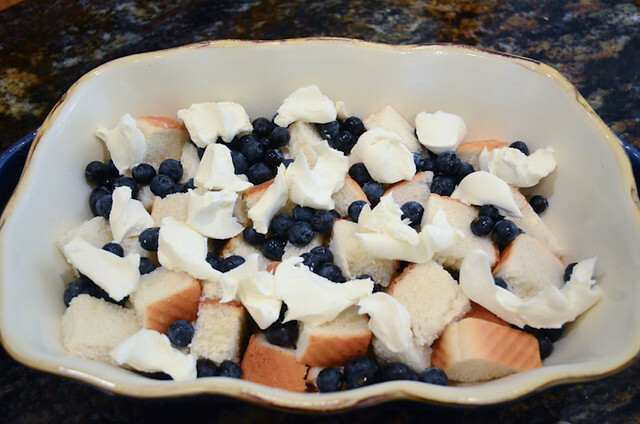 Sprinkle the blueberries evenly over the bread cubes and then place dollops of the mascarpone cheese over the top. 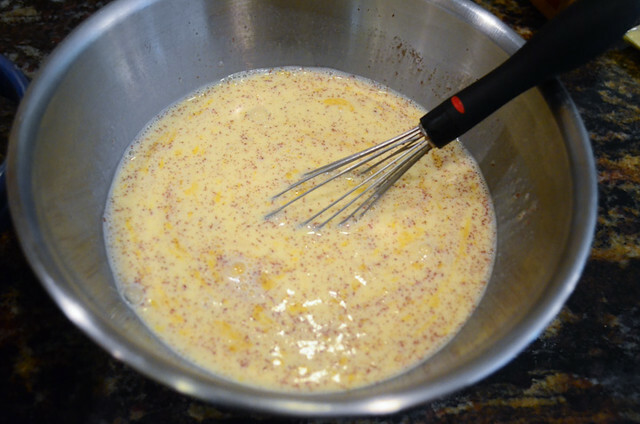 In a medium bowl, whisk together the eggs, milk, white sugar, vanilla extract, almond extract, cinnamon, and nutmeg. Place the remaining bread cubes over the top of the blueberries and mascarpone cheese and then pour the egg mixture evenly over the top in a stream, moistening the top layer of bread cubes. You are done for the day! Cover the dish with some plastic wrap and place it in the refrigerator overnight. In the morning, remove the dish from the refrigerator and let it sit on the kitchen counter while you make the topping and preheat the oven to 350 degrees. 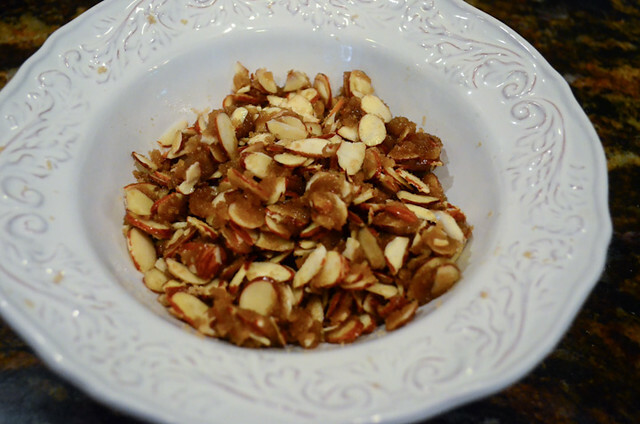 Mix together the almonds, brown sugar, and melted butter in a small bowl. Sprinkle the topping evenly over the top of the casserole and bake it for 40 to 45 minutes or until nicely browned. This would be an excellent addition to a breakfast buffet but is also good all on it’s own. I’m serving it up on the Haviland Limoge china that came down through my family from my grandmother, to my mom, and is now with me. This seems so right on Mother’s Day. A little maple syrup? Why not. The perfect indulgence for a special day. Enjoy and Happy Mother’s Day! The McCormick Spice giveaway closes tonight at 11:59pm PST. Click here to enter and win yourself a nice little Mother’s Day gift! Winners will be contacted Saturday, May 12. Coat a 9 x 13 inch baking dish with non-stick cooking spray. 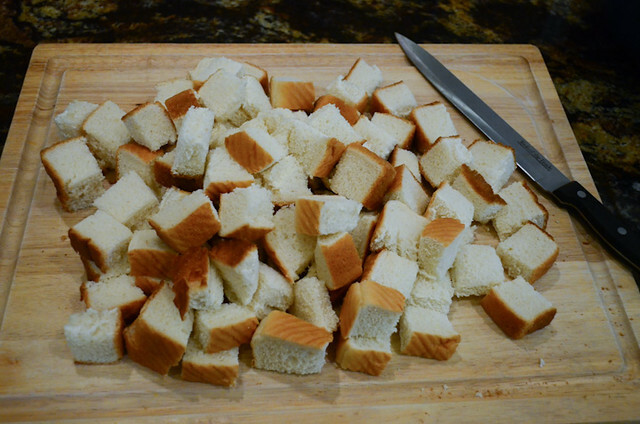 Cut slices of bread into 1 inch cubes. 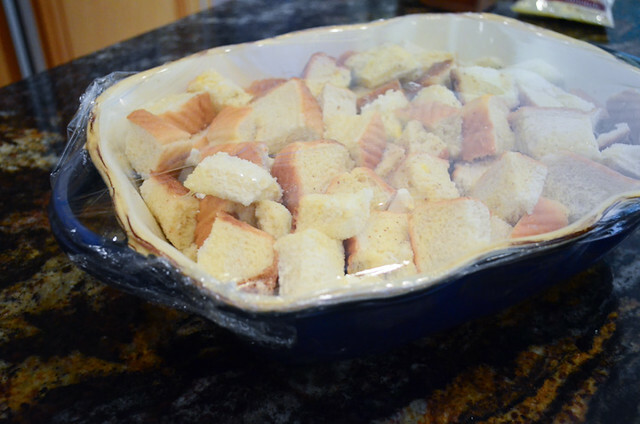 Place half of the bread cubes in the prepared baking dish and sprinkle evenly with blueberries. Drop small pieces of mascarpone over the top of the blueberries. Top with remaining bread cubes. In a medium mixing bowl whisk together eggs, milk, sugar, vanilla extract, almond extract, cinnamon, and nutmeg until well combined. 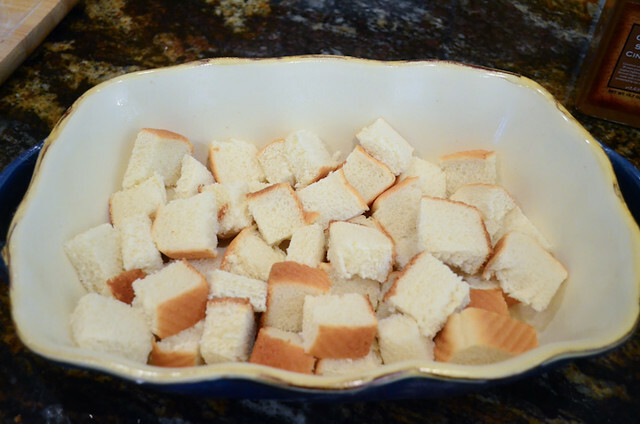 Pour the mixture evenly over the top of the bread cubes. Cover the dish with plastic wrap and refrigerate overnight. 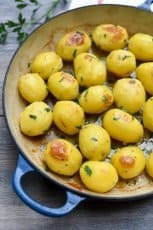 The next morning, remove the casserole from the refrigerator and allow the dish to sit on the counter while you preheat the oven to 350 degrees. Combine melted butter, brown sugar, and almonds in a small mixing bowl. 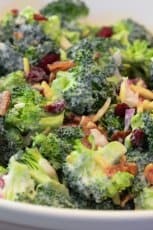 Sprinkle evenly over the top of the casserole and bake, uncovered, 40 to 45 minutes or until casserole is golden brown on top. If needed you can broil the top briefly to further brown the crust. Let rest 10 minutes before serving. 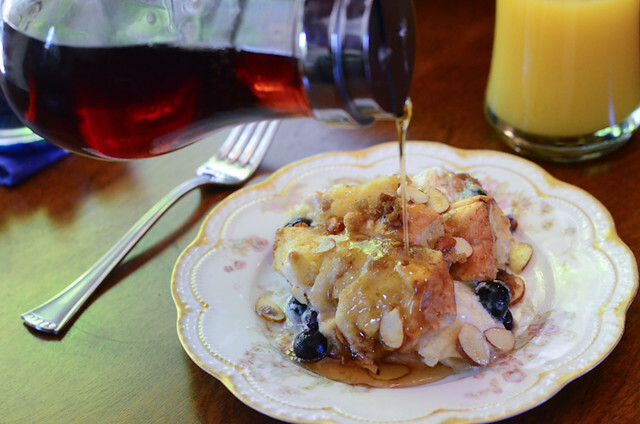 What a perfect Mother’s Day Breakfast/Brunch dish!! I hope your weekend is very special. So you’re sending your boys over to make this for me right! Right? Love this. Looks wicked good. Sure – they’re on their way 🙂 Happy Mother’s Day Kim! Thanks Willow. Your Mom is lucky to have you! Um, yuuuum!! What a nice dish to prep with the kids the night before. It looks so delicious! Yes, life is definitely no Hallmark commercial (would be a pretty boring life anyway). This sounds like the perfect breakfast, I really love French toast. I hope you have a fantastic Mother’s Day tomorrow! My husband actually made brunch reservations for tomorrow — but I’m going to tuck this recipe away for another time. Hope you have a wonderful Mother’s Day. Ooooh! You’re a sneaky ninja mom 🙂 Very cool way to get everyone involved in your special day. Delicious bake! I like that – a sneaky ninja mom. Nice! 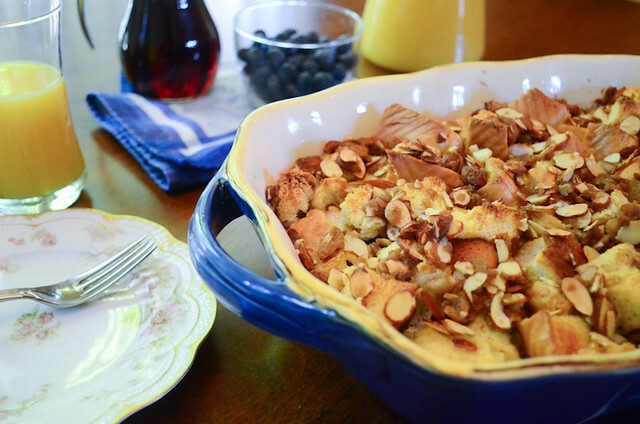 This French Toast Bake looks fantastic! We are huge french fans. In fact, we’ve had it twice this week. 🙂 I’m marking this so that I can make it next time. I love the idea and making it the night before and then just put it in the oven. Hope you had a wonderful Mother’s Day my friend! Happy mother’s day! And I’m loving this french toast. I’ve made baked french toasts with strawberries before and I absolutely loved it but I’m sure I’ll love this just as much, if not more! My kids usually make breakfast for me on Mother’s Day, but I had to work all day yesterday. We ended up with a not so gourmet breakfast for dinner instead. It’s the thought that counts right!? Hope you had a fabulous day celebrating with your family! Fantastic idea! Your boys did a great job. I’m sure this would have been a perfect treat on sunday morning. 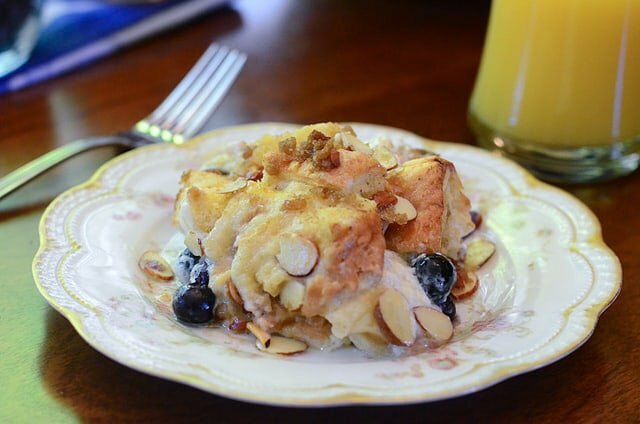 Mascarpone and blueberries with almonds sounds just perfect. 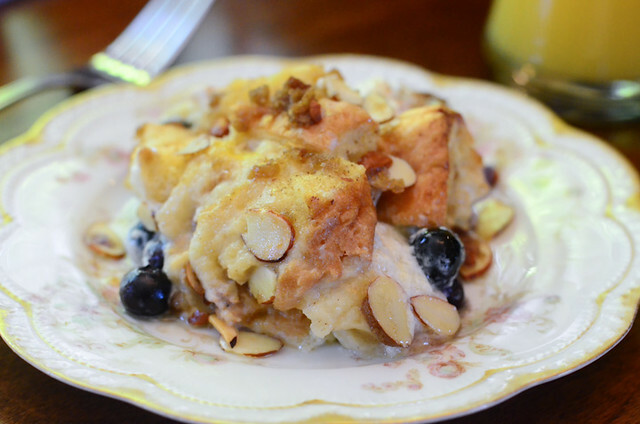 What a mouthwatering breakfast bake, Valerie! This looks so delicious! Happy Mothers Day! Good call and making this the night before, such an easier way to enjoy the day. Brunch at a restaurant on Mothers Day is FAR to hectic for my taste. oh man, this is such a delicious breakfast! would definitely love to wake up to something like this! Val this looks fantastic – breakfast bakes just totally RULE!! I didn’t noticed that I missed this post. My weekday is impossible to make something like this but usually weekends are more relaxed. This one sounds very lovely and I love to have this with my breakfast coffee to balance out the sweetness and bitterness… lovely recipe! 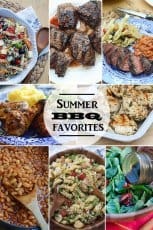 I just visited the Pinterest board you mentioned and was drooling all over it! Of course, this was the yummiest-looking of the bunch! We made this for our kids and it was a hit. Bill ate two servings and barely ate his lunch. Yum! I don’t like blueberries so will try wiht raspberries. We had this for brunch today and it was delicious! 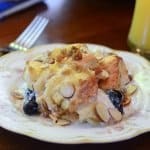 I already love French Toast Bake recipes but I loved the addition of almond extract (doubled it) and mascarpone in this. It was perfect! Used a loaf of Italian bread. Hi, I was just wondering if you’ve tried this recipe with anything but blueberries. 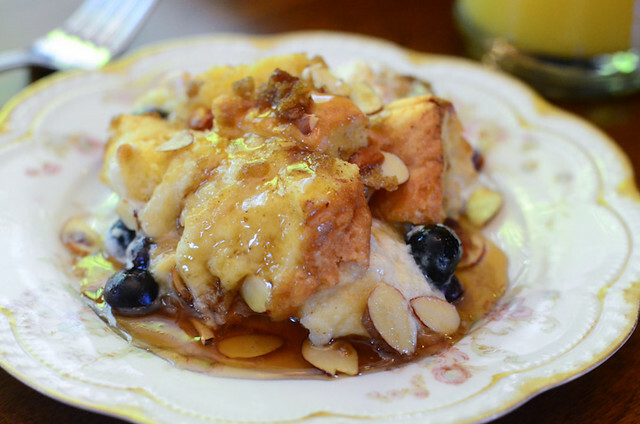 I was hoping to make this for a brunch coming up, but it’s December and fresh blueberries are nowhere to be found. I appreciate any and all suggestions. Thank you!